*Official Listing Agent Post* Coming Soon! MODEL PERFECT! TW LEWIS SINGLE STORY! POOL! This home has it all. Nestled in the exclusive gated Emerald Greens neighborhood in Estrella, this meticulously maintained retreat offers all of the amenities that executive buyers expect and more upgrades than any new builds in the area. This 3 bedroom, 2.5 bathroom gem has sizable rooms spread over a very livable, single story floor plan. Entertain friends and family in the private backyard oasis complete with a heated, salt water Pebbletek pool featuring a fountain and spa. The lot is the best of both worlds: large and yet low-maintenance, with young and maturing trees and cacti with plenty of room to entertain, play, or relax around the gas fire pit. Though this home is convenient and 15 minutes from the I-10, the backyard provides a sense of seclusion from the city and a peaceful retreat from the fast pace of daily life. The home features a beautifully upgraded kitchen with plenty of staggered cabinets and spacious granite countertops with tiled backsplash. Large master suite boasts private walkout to the backyard and a gorgeous bathroom with snail shower and garden tub. Additional features include: a full size 3 car garage with epoxy coated floors, blown insulated walls, and hanging and side storage cabinets with work bench; LED lighting throughout; tile flooring with inlay; gorgeous hardwood flooring in living and office areas; extended patio; gas fireplace; and much more. This home is a must see as there are no active listings in this area comparable at this price point with this many features and amenities. Estrella is a Top-Rated, Master-Planned Community with ”A” Rated Schools! HOA fees include use of Two Lakes, Yacht Club, Starpointe Recreation Center with Complete Gym Access, Lap Pool, & Waterpark! An additional recreation center, The Presidio, will open soon! Miles of hiking & biking trails! Gorgeous, Move-In Ready Home! Easy to view today! For more details, more photos, or for a private showing, please contact us. Thank you. 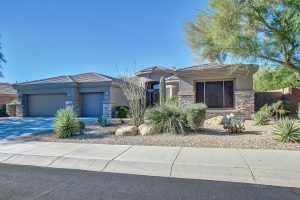 Todd and Amanda Kortright have been Top Producing Goodyear and Estrella Mountain real estate agents since 2005 and know the markets inside and out. If you would like to discuss buying or selling real estate in Goodyear, Arizona, please contact us here. Kortright Group’s Blog is the most comprehensive online source for Goodyear and Estrella Mountain information. Whether you are looking for the latest sales, trends or homes for sale in Goodyear, Kortright Group’s website has it all at your fingertips. Browse information regarding the Estrella Mountain Ranch Communities, Phoenix New Construction Homes, Palm Valley Homes, Pebblecreek Active Adult (55+) Homes plus much more.